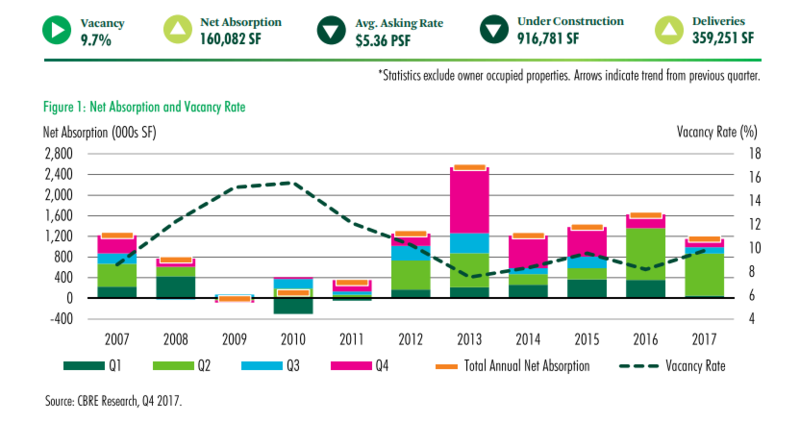 ​Net absorption of 160,000 sf in ​fourth quarter pushed 2017 to an annual total of almost 1.2 million sf. The vacancy rate finished the year at 9.7 percent, well below the market's cycle high and lower than the ten-year average. Market-wide average asking rates (warehouse) registered small quarterly and annual contractions, but Class A warehouse rents grew by 4.4 percent compared to 3Q 2017. Annual speculative deliveries for 2017 reached over 2.2 million sf, and six additional speculative projects remained under construction at the end of 2017. San Antonio's regional economy continued expanding as 30,800 seasonally adjusted jobs were added year-over-year in November 2017. ​​​Check out San Antonio-New Braunfels Industrial Market Research​.